Katherine the Great » Blog Archiv » Let’s pretend it’s June 2014, shall we? Let’s pretend it’s June 2014, shall we? 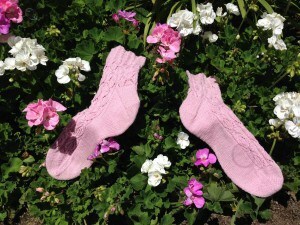 It’s come to my attention that I never blogged the pretty pink socks I knit for my SIL. 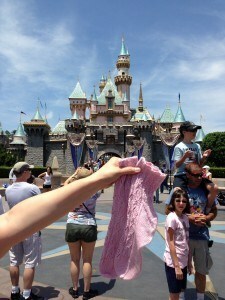 This pattern is lovely and delicate and immediately brought my pink-loving sister-in-law to mind. I made the 72sts size and was really pleased with them. 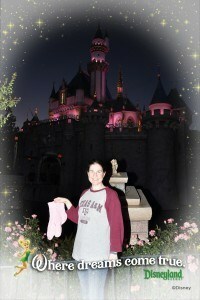 I grafted the toes of sock 2 in June of 2014 and was able to take some glamour shots at Disneyland. Needles: magic looped with addi turbos…the size would be a handy thing to know, wouldn’t it…2.25mm maybe? Mods: There’s a point where there’s 2 purls on one side of the top of the foot and one purl on the other side of the top of the foot. I moved the heel over a stitch on the second sock so that the two purls and one purl sides were mirrored from the first sock. I analyzed the chart and totally understood why this asymmetry had to happen, but the mirroring helped me sleep at night.